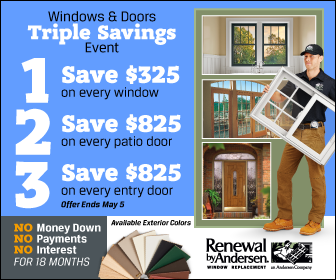 Renewal by Andersen® windows aren’t just installed to improve the design of the home. They also improve overall energy efficiency. The company’s windows replacement process ensures that this is met through expert installation and the use of the latest technology in its framing materials and glass. This article discusses one key component of energy-efficient windows: glass packages. Renewal by Andersen glass provides the necessary heating, cooling, visible light transfer and ultraviolet (UV) protection qualities you are looking for in an energy-efficient window. It utilizes a state-of-the-art technology, both on the exterior and the interior. On the exterior of the glass, the metal oxide coating is applied to enable easy surface cleaning. When activated by sunlight, the likelihood of water spotting is reduced to 99%. Meanwhile, a light, multi-layer low emissivity (Low-E) coating is applied on the glass interior. This allows for visible light to pass through the glass while reflecting heat. With this coating, you remain comfortable both during summer and winter months. Before windows installation begins, you will have to choose which glass option is best for you. The climate you live in, the architectural design of your home, the placement of your windows in relation to the sun and your desired “custom climate” are some of the factors you need to consider. High-Performance™ Low-E4® glass – Standard for all windows we manufacture, it blocks 83% of harmful UV rays. It is effective in improving energy efficiency by up to 47% in the winter and 56% in the summer in comparison to ordinary dual-pane glass. High-Performance Low-E4 SmartSun™ glass – It provides better energy efficiency by up to 49% in the winter and 70% in the summer. It has the best daylighting capabilities while blocking the sun’s heat. High-Performance Low-E4 Sun glass – This glass has a tint coating that brings in just the right amount of visible light while keeping your home cooler during warm weather. For your casement windows, choose Renewal by Andersen of St. Louis. Call us today at (314) 332-2364 so we can talk about the right glass type for your new windows. We serve areas in Missouri, including St. Charles, MO.